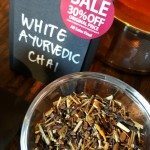 Did you know Teavana has lots of Chai teas? 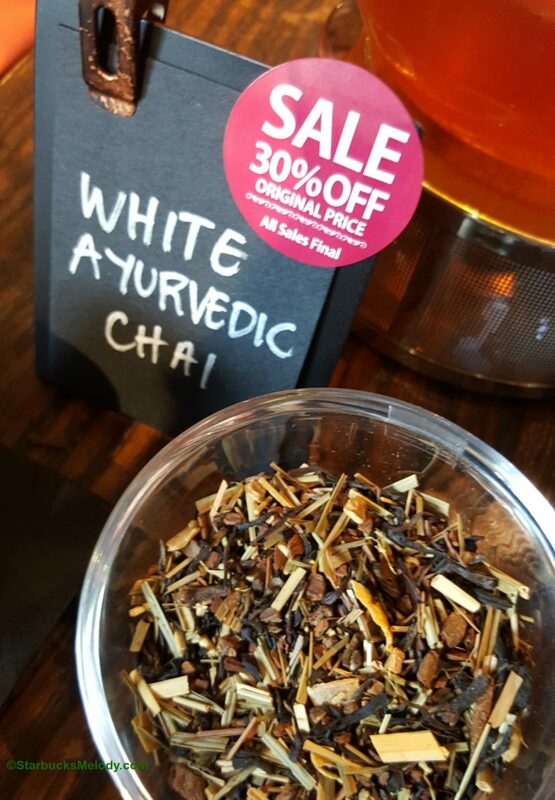 Not that long ago (it was October 10th), I dropped by the Teavana tea bar in University Village, and saw that they were sampling many different chai teas. I didn’t even know that they offered so many chai teas! It was a great experience to be able to taste four different chai tea blends, one right after another. 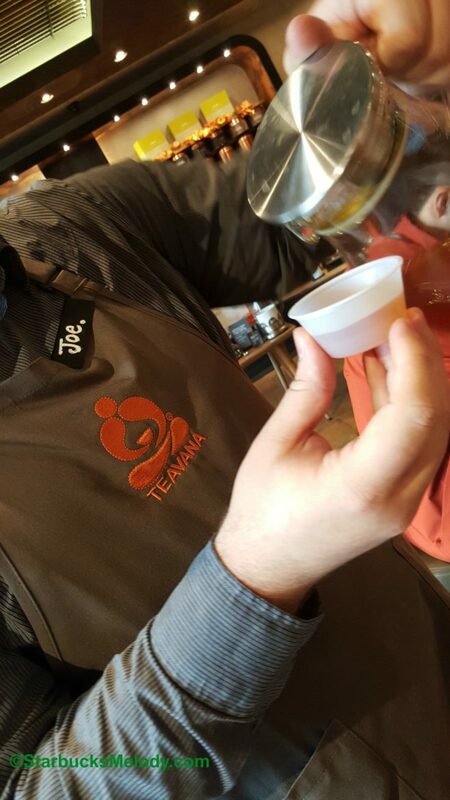 Teavana partner Joe started with the spiciest and ended with the sweetest chai teas. This was a very interesting tea. The chai flavors were very strong. Since the tea itself is soft and elegant, the spicy notes express themselves in a pronounced way in this tea. This was good but since I’m not really a spicy chai drinker, this wouldn’t be my first choice. I hate to tease you will the signage that says 30 percent off, but please disregard all the sale signs in this article. I visited Teavana over the Columbus Day weekend, and there was a special promotion going on just for that weekend. So just disregard all the 30 percent off signs in this article. Next up, I tried Caramel Chai Rooibos Tea. This is a fun, creamy, sweet tea. I thought the caramel flavor was soft and mild, and while present, it doesn’t overwhelm. Also keep in mind that this is a Rooibos tea so you can steep it a little longer – up to five minutes. 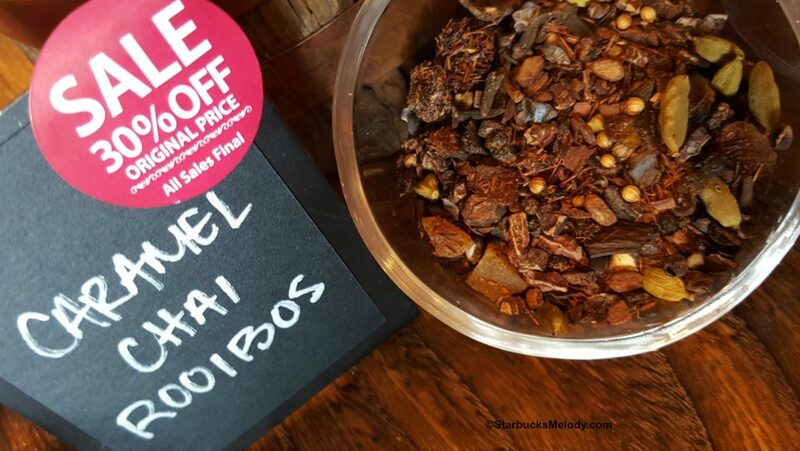 Rooibos teas are also naturally caffeine free. 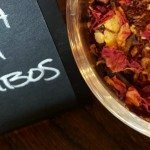 The third tea we tried was the Dosha Chai Rooibos Tea. This was definitely the sweetest of the three. Joe, the Teavana partner guiding me through the tasting, mentioned that teas that are little heavy in cinnamon components tend to be a lot sweeter. Cinnamon sticks add sweetness to a tea. This was also a weightier tea, compared to the first one. The white tea is light and elegant in the mouth. Finally, we tried the Chocolate Chai Black Tea. This tea is a complex tea with all kinds of flavors happening in it. 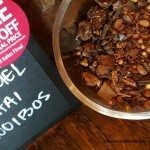 It has chai spices, lots of black tea flavor and mouth-feel, as well as a gentle chocolately flavor. While Joe and I didn’t try this tea together, remember that if you’re in either a Starbucks or a Teavana, you’ll find Oprah Chai tea. Oprah tea comes in a regular version as well as an herbal Orpah tea. The standard Oprah Chai tea is very spicy! When you’re in a Starbucks, and you order an Oprah Chai Latte, your barista will use a concentrate to make your beverage. It’s not made with loose leaf tea, like in all the examples above. 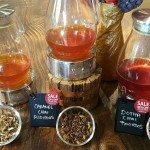 A few areas of the country have a “Teavana Custom Chai” tea test going on. Just know that when you are ordering a chai latte inside a Starbucks, you’re not getting a loose leaf tea chai beverage, rather a concentrated liquid designed just for your drink. 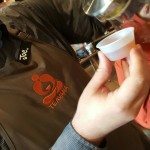 The areas of the country that have the “custom chai tea test” are serving customers an unsweetened Teavana tea chai, and then you add syrup separately (or the barista adds it for you). Thank you for joining me for another episode of #TeavanaTuesday. If I have new Teavana news, I try to feature that on Tuesdays. 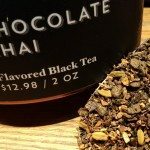 You can follow my Teavana stories separately from StarbucksMelody.com here at TeavanaMelody.com. 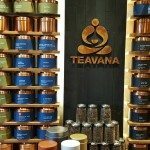 Keep in mind, TeavanaMelody.com is updated, at most, once per week and is somewhat under construction. The Beast Mode Frappuccino: How You Can Order this Marshawn Lynch Frappuccino! Get your beautiful cat or dog featured on Pets of Starbucks! Butterscotch and Teavana Citrus Green Tea Lattes? Yes Ma’am. But only for a short while. Teavana – University Village Store. Teavana & Care.org partner to lift up women in poverty in Asia, India, and Africa. New for spring! 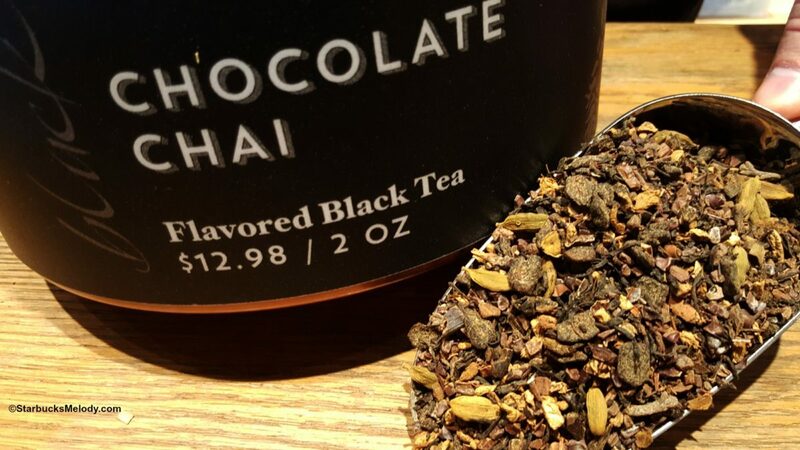 Teavana introduces Chocolate Bananas Foster tea. I like the “idea” of tea, but find that it dries my mouth out. However, these chai teas sound worth the experimentation. It’s interesting… Teavana has a bunch of “chais” but doesn’t have the traditional masala chai made with black tea. I find this omission baffling.